By this time Sonic had made his first quasi foray into the world of 3D courtesy of Sonic 3D on the Mega Drive/Genesis and Saturn. Now this board style of gameplay is handed down to 8-Bit in the form of Sonic Labyrinth released in 1995 on the Game Gear. Dr Eggman comes has the sudden realisation that if Sonic were to loose his break neck speed he wouldn't be half as much trouble. Eggman sets about figuring out how to do this. Later that day Sonic awakes and slips on his red shoes. They are uncharacteristically heavy, so heavy that he is not able to run or jump. Sonic attempts to remove the undesirable footwear to no avail. He notices an Eggman insignia on the bottom and in that moment a booming laughter and boast from Eggman reveals that only the power that created them can remove them, that of a Chaos Emerald. The elusive emeralds are now buried deep in Eggman's great labyrinth stronghold. Work promptly begins to turn South Island into Eggman-Land. 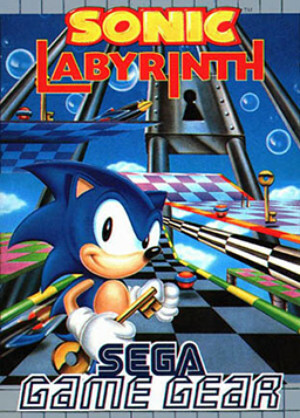 Sonic must attempt to navigate the obstacle course of the labyrinth to retrieve the Chaos Emerald with only his spinning ability to his name in order to restore his speed. The gameplay takes place on boards in which you must find the 3 keys required to open the exit that are hidden or attached to enemy bots within a time limit shown as a countdown on the screen. When the timer hits zero Sonic dies and restarts the round. The change in visuals along with the break in traditional formula plus lack of speed provokes mixed feelings of the gameplay overall though let it be said not like G-Sonic!. Graphically it is interesting to see the isometric style on an 8-Bit platform and it does feel not too far removed from Sonic 3D. The music is unmemorable to say the least. Boards in the labyrinth are loosely littered with the usual pinball-esk items such as bumpers and flippers with a selection of robots and occasional hazards. 5 seconds extra time can be added to the clock by destroying the enemies about the boards by means of a Spin Dash and collecting those essential keys will add 30 seconds. Taking a hit with rings in your possession causes keys to scatter. Fast retrieval is necessary as they will soon return to their original location on the board. Retrieving lost keys does not yield you the 30 seconds extra time. Rounds 1-3 are bereft of rings so taking a hit via an enemy bot or touching spikes looses 10 seconds of time. On Round 4 they protect against a hit from the boss. Collecting 100 rewards an extra life. Since Sonic has no real speed in this game the countdown to death can be somewhat harsh. The fastest and somewhat necessary way in which to get Sonic about is to use the Spin Dash (or Rolling Attack) frequently. It is implemented differently to other games. You will need to hold down either button to rev with power indicated by arrows overhead and then target his angle with the D-pad. Release to shoot off. Pressing a button mid-Dash results in a full stop. Though the game offers two options for tweaking the directional controls effecting Sonic's walking (selected on the title screen) there are still some issues to be had. The START button pauses the game and for assistance which then allows you to explore the board without the countdown. 1-Up - Extra life. Scarce. The game consists of 4 themed zones which are made up of 4 rounds each. The fourth round will be a fast slide loaded with various obstacles. Sonic plummets through a narrow, winding slide. Touching spikes will make Sonic loose rings. Touching glass or (gas) will slow Sonic down. Moving to grab a 100 rings during this descent will reward an extra life. At the end of a rolling obstacle course will be a boss encounter. The timer is replaced in favour of traditional Sonic rules where rings collected on the slide provide the lifeline. Note that when Sonic takes a hit, lost rings can not be retrieved. The end of each round or act the time remaining on the clock earns bonus points and your speed is calculated in kilometres per hour. You begin the game with 3 lives by default. Upon game over (or completion of the game) you are given an overall rating out of 5 stars. The best time and score are recorded on the leaderboard. There are 6 Chaos Emeralds in total. They are collected after defeating bosses and the fifth emerald is obtained from Eggman as he makes his escape following defeat in the final confrontation. The ending sequence changes depending on having collected all 6. Finishing the game with less than 6 will run the bad ending as opposed to the good one and give a cryptic clue as to the location of the 6th. Obtaining the 6th emerald requires play of a Bonus Board found in Zone 2-3 (Sea). In the lower right edge of the board, look for a closed door with a "BONUS" sign. Access is granted by means of a switch. Head for a cannon found in the lower left hand corner of the round. Whilst in the cannon, press hold RIGHT on the D-pad along with buttons 1 and 2 simultaneously. Continue holding until the cannon fires and Sonic is sent to a secret platform with a switch to control the door. The bonus board is open and is littered with bumpers and rings. You have 30 seconds in which to collect as many rings as possible. Each ring is actually worth 25 so only 4 are needed for an extra life. The Bonus Board ends when you fall off the board or time is up promptly removing you back to Zone 2-3 though you will have the emerald added to your total automatically. In addition to the main game Time Attack which pitches you against boards where you will be rated by a method of stars and given a password. Options are available from the main title screen under Config. Sonic (Lives) - adjust the number of lives to a max of 10. Sound - Play the tunes and sfx in the game. Key Control - toggle between Straight (default) or Slant. The default makes the walking direction at normal 90o. Slant reduces the angle by about 30o (isometric) to presumably match the lines on the board. Practice recommended. 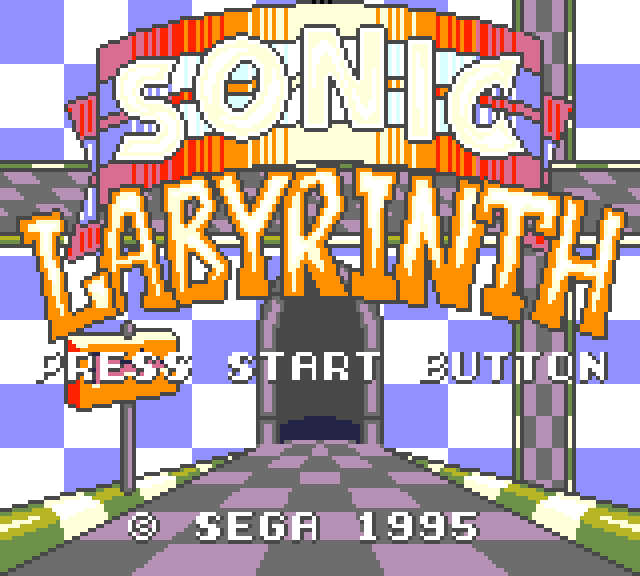 On the title screen, when the Sonic Labyrinth logo appears push UP, UP, RIGHT, RIGHT, RIGHT, DOWN x6, LEFT x9. The word "select" should now appear. Goto the options menu and sound test should have been replaced with level select. This cheat is revealed to you when completing the game with all 6 Chaos Emeralds. This game is best played with the KEGA Fusion emulator which you can download from the SEGA Game Gear Emulators page. When using DEGA, the game fails to play beyond the starting line. The five digit password seen in the Options has no actual use within the game. It was actually for a contest held by SEGA of Japan between November 17th and December 31th, 1995. The contest was only open to Japanese players with some Sonic related merchandise awarded as prizes to the Top 100 contestants. Sonic Labyrinth was also included in Sonic Adventure DX as an unlockable and Sonic Mega Collection Plus.